After being ordained in 1994 with the first wave of women priests, Janice became curate in a large city centre parish in Norwich and from there, moved to South Norfolk in 1999 as Rector of a rural benefice of six parishes. 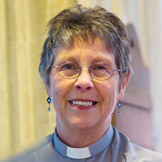 After completing her MA in Pastoral Theology with the Cambridge Theological Foundation in 2008 she was appointed Honorary Canon of Norwich Cathedral. Janice now lives with her husband Ian just outside Norwich. In addition to her diocesan work and writing "The Village Shepherd," she is a freelance writer for Redemptorist Publications in the UK. She has also written and broadcasts "Pause For Thought" on a local radio station and has written several novels, all with a church background. On a recent visit to Sweden to a parish just south of the Arctic Circle, we took Easter eggs as gifts for the children of our host family. They were greeted with delight and considerable interest, for although the Easter tradition in Sweden is for decorated eggs, their eggs are of the hard-boiled variety rather than chocolate eggs. Chocolate eggs were a great novelty for the youngsters and they displayed them with pride to all their friends. Very early in the morning on that first Easter Day around 2000 years ago, Mary Magdalene went to the garden tomb alone. Why did she go? She couldn't do much by herself. She would need several men with the right lifting gear to shift the great stone closing the entrance to the tomb. And she'd need the other women to help embalm the body of Jesus. So why go alone? Perhaps, with the stress of the previous week or so, she couldn't sleep and was just wandering aimlessly, but found herself drawn like a magnet to the grave of the person she loved. We Christians are often reckoned to be a sad bunch, at least in the opinion of non-Christian western society. And sometimes, I think they're right. We must seem a bit pathetic to normal red-blooded human beings as we go to church each Sunday, singing hymns and indulging in all kinds of odd rituals, when we could be cleaning the car or shopping or playing sport or otherwise enjoying ourselves. Once upon a time in the heart of a certain kingdom, lay a beautiful garden. Of all the dwellers of the garden, the most beautiful and beloved to the master of the garden was a splendid and noble Bamboo. Year after year, Bamboo grew yet more beautiful and gracious. He was conscious of his master's love, yet he was modest and in all things gentle. Often when Wind came to revel in the garden, Bamboo would dance and sway merrily, tossing and leaping and bowing in joyous abandon. He delighted his master's heart. One day the master spoke: "Bamboo, I would use you." Bamboo flung his head to the sky in utter delight. The day in which he would find his completion and destiny had come! His voice came low: "Master, I am ready, use me as you want." The liturgy can start with a procession in which a child carries the Easter candle from the West end of the church to the altar at the East end, stopping at intervals to raise the candle high and cry, "Christ our Light". The people respond with "Alleluia!" All the candles in church are then lit from the Easter candle. The Lord is risen, he is risen indeed! Let us rejoice and be glad in him! Jesus, we turn to you. Jesus, we believe and trust in you. What is The Village Shepherd? The Village Shepherd offers sermons, bible stories, children's stories and prayers based on the Revised Common Lectionary. These inspirational sermons, stories, and prayers are sure to touch your heart, because they reflect the simple virtues and tranquil serenity that characterize Reverend Scott's English countryside pastorate. The questions "Where is God in this particular situation?" and "Where does the Gospel story cross our own human story?" are always at the heart of these meditations -- but rather than finding overt answers, instead you will be gently led to make your own connections and discover the powerful ways in which God works. Janice Scott has the unique ability to find interesting details in ordinary life that illuminate scripture, while still challenging even the most intellectual reader. And that gift is precisely what also makes her an outstanding communicator with children.